Good afternoon, everyone. I want to thank Susan Witt and the Schumacher Center staff for arranging this wonderful program for us today. I’m proud to be a part of it. Before I sat down to write this introduction, I cooked up a big bowl of Ojibwe wild rice that I buy regularly from the Honor the Earth online store. I love the nutty flavor of the rice and its distinctive aroma, that of the pristine lake water where it grows in Northern Minnesota. The smell of the lake is a reminder to me of a way of life rooted in nature that has existed for many generations. Hand harvested by canoe and parched over wood, the wild rice is called Manoomin, which means the food that grows on water. It is sacred to the Anishinaabe people to whom the Ojibwe tribe belongs. Wild rice is part of their original creation story and has nourished them for thousands and thousands of years. It is here in wild-rice lake country in the far northern headwaters of the Mississippi River where our keynote speaker Winona LaDuke lives and works. These are the waters, the land, and the culture that she is dedicated to protecting from the threats of industrialization, GMOs, pollution, and mining to the current fight to stop a fossil fuel pipeline that endangers the waters of the sacred wild rice. And it is here that she is building a restorative economy based on the ancient understanding of reciprocity that will restore not only the land but also the people. The theme of today’s lecture, “Prophecy of the Seventh Fire: Choosing the Path That Is Green,” is based on an ancient prophecy of the Anishinaabe, Winona’s people, that predicts there will come a time when we must choose between two paths. One path will be green and lush; the other will be well worn but scorched. The time has come for all of us as individuals and collectively as communities and as a society to make the choice. During this time of the Seventh Fire, Winona is a courageous warrior fighting to stop the fossil-fuel driven industrial economy from taking us down the scorched path toward oblivion and simultaneously a dedicated builder of a new economy in harmony with natural systems as she leads her community and the larger society down a green path towards a peaceful and loving world. On the land of her ancestors Winona is focusing on relocalizing the economy, cooperating with other tribes to meet basic needs regionally through sustainable agriculture, renewable energy, and fiber production from hemp farming that will not only provide food, energy, textiles, and other supplies needed by her community but also provide meaningful, healthful, nontoxic jobs. Winona’s influence and impact reach far beyond White Earth. 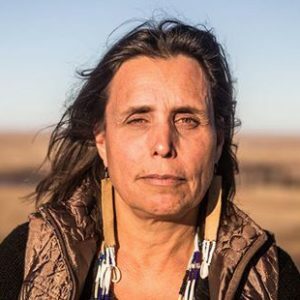 Not only is she creating a sustainable model at home, to be shared with others, but she is also an international leader in indigenous rights and environmental justice. As the Executive Director of the indigenous environmental advocacy organization Honor the Earth, which she co-founded in 1993, Winona has national and global in influence. Among many things, Honor the Earth markets the wild rice called “Pipeline-Free Manoomin,” which I enjoy. Last year I got to know the work of Honor the Earth when I visited Standing Rock, where the organization played an active role in the struggle to stop the Dakota Access Pipeline from reaching the Missouri River in neighboring North Dakota. This brings me to another important indigenous prophecy that addresses a major reason for taking the green path. It tells of a black snake that would one day rise from the deep and move across the land bringing destruction and great sorrow. Indigenous people believe that the black snake has arrived in the form of the most powerful economic force in the world: the fossil fuel industry with its oil pipelines. As the prophecy further warns, if the earth’s people do not unite to defeat the black snake, the world will end. On my wall at home hangs a poster entitled, “Last Breath of the Black Snake,” which depicts cowboys and Indians joining to defeat the black snake. It is here that I see one of Winona’s greatest strengths: as the prophecy calls for, she is bringing together the descendants of settlers and the descendants of the original people of this land to defeat the black snake and follow the green path in brotherhood and sisterhood. Through her communication skills as a leader, as a public speaker, and as the author of five books, Winona is an effective interpreter of Native American views and a powerful spokesperson for her people, who, through generations of genocide, betrayal, and theft of their lands, have to a remarkable extent retained their way of living and their way of thinking. I first met Winona by email and over the phone when she was helping Jodie Evans and me with a project to give back to the Water Protectors at Standing Rock. At one point, Winona said she had to get off the phone because she was participating in a pony ride. So that became my first and lasting image of Winona: galloping her pony across the plains, her long black hair owing behind her like the mane and tail of her pony: riding for the land, riding for the water, riding for her people, riding for her children and the generations to come. Winona, thank you for your life-affirming work. As the descendant of settlers, I apologize for the wrong done to your people and hope for forgiveness. As your sister of a common mother, I walk with you down the green path. On behalf of the Schumacher Center, I welcome you to the stage. Thank you very much, Judy, for that gracious introduction. Chi-miigwech. Hello, my relatives. Aniin, ni-inawemaagan. That’s some of my Anishinaabe language, which is related to the indigenous languages from here in the Berkshires. Long, long time ago, mewinzha, my people lived here and I’m always grateful to come back here to my homeland and see my relatives and see the place where my ancestors thousands of years ago lived. So I’m happy to be here with all of you today. When I realized that I could not show you the beautiful slides from my community because there is no projector here, I did a rewrite downstairs. As I reflected on what to say, I thought, first I want to tell you that in our language this month of November is called Gashkadino-Giizis, which means the Freezing Over Moon. Then the moon that follows is called Manidoo-Giizisoons, which is the Little Spirit Moon and then Gichi-Manidoo-Giizis, which is the Great Spirit Moon. The moon in February is called Namebini-Giizis, which refers to the suckers, a kind of fish. We would often spear them through the ice. That is what we do in our territory—we spear and net through holes in the ice. Then we have a moon named Onaabani-Giizis, the Hard Crusted Snow Moon, when it thaws and freezes again. Also known as the moon under which you don’t want to do a faceplant in the snow. That is around March in my territory. Iskigamizige-Giizis is our Maple Syruping Moon, which you have here too. We have it from middle of March to April, but yours may be a little earlier. Then we have Waabigoni-Giizis the Flower Moon, Ode’imini-Giizis the Strawberry Moon, Miini-Giizis the Blueberry Moon, Manoominike-Giizis the Wild-Rice-Making Moon, which is from August into September. And then we have a moon, Waatebagaa-Giizis, when the leaves change color, and Binaakwe-Giizis, when the leaves fall. Looks like you’re still in that one here, right? In December we have Gashkadino-Giizis, the Freezing Moon. I’d thought you’d like to hear what a calendar based on the land and sky sounds like. Did you notice that none of our moons is named after a Roman emperor? Did you all get that? Part of this is to say that it is possible to have an entire worldview that has nothing to do with empire, and you’ll be okay. Though there are some heavy bags to carry around, I think you should just ditch them, all right? That’s the first part of the lecture: ditch those bags. When I reflected on what I wanted to talk to you about, I decided on Wiindigo economics, or cannibal economics, and that is the economics system within which the United States operates. I was an undergraduate at Harvard and studied economics, and Wiindigo economics was then and still is what is taught in every university, a predatory economic system based on the idea that you can just keep taking and you will not have to pay for what you take. That is a really faulty economic system, is it not? I asked one of my elders, “What is the word for economics?” and he replied, ondizi, “How we live.” That’s what he said: “How we live.” Then he said, “There’s also the white man’s system.” That’s when I learned that in an indigenous worldview economics is how we live. In our community we have the term minobimaatisiiwin for the good life. Minobimaatisiiwin. It refers to how you will relate to the world, how you will relate to one another, and how you will have a good life. I think of it in the context of my being obviously privileged: I travel around the world and visit cool places like Vanuatu, an island nation in the South Pacific Ocean and the country with the happiest people in the world according to the Happy Planet Index, which analyzes data on levels of reported happiness, life expectancy, and ecological footprint. Vanuatu was estimated to be the most ecologically efficient country in the world in achieving its high degree of well-being. I went there to see why they were so darn happy. We can talk about that later. I realize that our idea of how best to live is a lot like the Gross National Happiness Index. It is based on a covenant that we as Anishinaabe people have with the creator—a covenant about how to relate to the world around us, about what our responsibilities are. In the larger world there’s a lot of rights-based analysis—it is my right to do this, it is my right to do that. I would say that we are a responsibility-based culture because with rights go responsibilities—as spelled out in our covenant, this our code of ethics. I often find it interesting to refer to the white-man paradigm because—let us be honest—that is where the idea of, for example, natural-resource management came from. What I think is that you have to manage yourselves, all of you. Do you know what I mean? The natural world is doing pretty well. It’s the white-man worldview that says, “We’re going to do it this way,” regardless of how harmful it may be for the natural world. I’m sure you’re all pretty enlightened, and I think that now would be the time to talk about the idea that the paradigm which got us into the predicament we’re in does not have the answers to get us out. I also think we need to be open, we—which means you—need to have courage. We’re going to have to let go of some of what we’re used to, and we’re going to have to work together because we are all in the same canoe. We’re all in the same place. In our teachings as an Anishinaabe people, where we are now is referred to as the time of the Seventh Fire. It is said that long ago prophets came to our people—the same prophets who instructed us specifically where to go—and they said that at the Time of the Seventh Fire, we as Anishinaabe people would have a choice between two paths. One path, they said, would be well worn, but it would be scorched; the other path, they said, would not be well worn, it would be green. It would be our choice upon which path to embark. Frankly, I’m pretty sure that’s where we all are now. We’re at a moment in time when we have the ability to stop the prevailing white-men mentality from combusting the planet to oblivion. We have a shot at keeping them from genetically engineering the world’s food supply. We have a shot at keeping them from topping off any more mountains in order to provide coal to sell, not even here but to India. We have a shot at stopping some pretty extreme behavior at the end of the cannibal or Wiindigoo economy. This, in my estimation, is a great spiritual opportunity for us all. Let me talk a little bit about what I would call the precepts of minobimaatisiiwin—the good life. Last night I was in Madison, Wisconsin, with my community, and a tribal leader whose name is Mike Wiggins was there, a super-modest guy. For many years he led the Bad River Band of Ojibwe on the south shore of Lake Superior in what’s known as Wisconsin. This tribe really doesn’t have a lot. I don’t think you get out much to our territory, but let’s just be honest: there’s not a lot of infrastructure there. We’re considered poor by your standards, but we have a wealth that is so much greater than what most of you have. At the same time, we’re toughing it out. So the tribe endured hardship, but they still were able to fight off many mining projects. I don’t know if you’re familiar with the history of the state of Wisconsin: in 2003 The Mining Journal said that Wisconsin was the hardest place in the world to put in a mine. Because of multi-racial alliances, enough people said, “You’re not going to put those sulfide mines in here.” They fought off a huge taconite mine as well as the state of Wisconsin under the leadership of Governor Scott Walker, who was trying hard to push that mine through, but those people were determined. One day I was standing with Mike Wiggins at our ceremonies, and he told me he’d been at the state legislature. He said something to me I’ll never forget: “You know, seems like those people don’t want to hang around another thousand years.” That’s what this is about: do you want to hang around or not? We’ve been living here for ten thousand years. We want to continue to persevere. That’s our plan. Let me talk about how I think you get to hang around. These are the tenets, I would say, for what I view as the essence of sustainable thinking in indigenous communities. The first is the understanding that the Creator’s law is the highest law, higher than the laws made by nations, states, or municipalities, and one would do well to live in accordance with the Creator’s law. Second is an understanding that the natural world is cyclical—whether it is time or moons or tides or our bodies themselves. We are cyclical beings, and the natural world is full of cycles. The third is the understanding in our worldview that most of the world is animate. Boy, that’s a hard one for science to get, isn’t it? I went to look at a big rock near here. For us asin, “a stone,” is an animate noun, which means having reverence for something bigger than yourself, you know? The world is animate. Instead of understanding the world as animate, most of us see it in terms of commodification so that everything has a dollar value. Mitigation is usually the answer for the huge pipeline proposals I’m facing. A representative from the State of Minnesota said to someone with the pipeline: “You know, that pipeline is really going to mess up those Ojibwes. I hope you can deal with it.” It’s pretty much what was said in the Environmental Impact Statement: The damage will be mitigated, and it will be sorted out. My reaction was, “That’s not going to work.” You and I know how far we have come with the whole idea of commodification instead of thinking in terms of the seventh generation from now. Decisions are based on quarterly profits. That’s three months. Instead of thinking in long-term futures, politicians think only about the short term until the next election. About ten years ago I went and talked to tribal elected officials about a carbon-free future. I was talking about climate change, and I remember those tribal leaders looking at me as if to say, “Hey, that’s not going to happen while I’m in office, is it?” Isn’t that how they think? That problem isn’t going to arise during my four years. The whole set of dysfunctional thoughts is to a certain extent what got us into this mess we’re in now. What anthropologists call reciprocity means that when you take something from the natural world, you take only what you need, and you leave the rest. That way you’re allowed to continue your harvest intergenerationally. When I harvest, I pick whatever is pickable because I have a lot of mouths to feed. I have raised six kids, and I have eight grandchildren. I would say there are more kids who appear at my house every day. I am grandma to a lot of people in my village because a lot of women don’t live as long as I have lived. I’m 58. Kids show up and ask, “Can I call you Granny?” and they move in. So I’m talking about needing half a buffalo, four deer, a hundred fish. We grow all of our own corn, we harvest our own rice, and then we pick anything that can be picked. You would too if you had that many kids because that’s how you’re going to survive. It’s a good life. It’s all there, you know, and you always take what you need and leave the rest, and you always pray. You’re grateful to the plant that gave itself to you; you’re grateful to the animal who gave you her life or his life. You’re always grateful for those gifts. I’ll tell you a funny story. One day I was working with some really stubborn men. I don’t know if any of you have had that problem. I was trying so hard to be patient. My sons were going fishing, and I prayed, “Creator, please help me with these bullheaded men.” Then I said, “And please, we need to have fish, so please, I pray that you are generous.” Well, my net—we net fish—came back with a hundred bullheads in it! My sister said, “You should have separated the prayers a little.” A hundred bullheads. Man, that meant a whole day of trying to get those babies cleaned. What I’m saying is that I see to it that things are taken care of all the time, but sometimes I mess it up too. You’re all pretty enlightened, so you know that the Wiindigo system doesn’t work like ours. Instead of understanding and respecting the natural world or the rights of Mother Earth or the Creator’s laws—the highest laws— we live in a society that writes a bunch of laws based on who’s in power, redistributes pollution, arbitrarily changes recommended daily allowances of radiation and contaminants, and pretends that it’s all right to allocate the water in western basins until there’s no water left there. That’s the arrogance of a system that has no check with reality. And that’s what’s going on. There is no understanding for a cyclical system. We all live in a super-linear world instead of a cyclical world, and perhaps one of the best examples of that, in addition to the pipeline battles, is the fact that we live in a society with something like 13 trillion pounds of waste produced annually in the U.S. That doesn’t include waste water, and I ask myself, what is waste water? There’s no new water being made. In 2010 Americans wasted some 133 billion pounds of food. With a 430 billion pound food supply, that’s more than one-third of the whole being wasted. Economically, it’s $161.6 billion in food wastage. And so we have created this society where, if you want a long-term plan for your little town, you might create a waste dump, right? That provides permanent employment. We acquire new stuff, then we toss it three or four months later or maybe a year later. It’s become junk, and you all know it. That’s a linear economy, isn’t it, when you take stuff and then you throw it out. A young woman who stayed with me said, “When people say they’re throwing something away, what do they mean by away?” Where is away? There’s no away. We do that socially too, and the fact is that the social production of waste is the prison industrial system, isn’t it? We live in a society where, of the nine million prisoners in the world, about two and a half million are in this country. To build an economy based on prisons is not a functional long-term goal. One of my favorite towns in that regard is Grants, New Mexico. It used to be the carrot capital of New Mexico, which is when I liked it even though I wasn’t there, but in the 1940s and 1950s when uranium was discovered, it became the uranium capital of New Mexico. After that it became the prison capital of New Mexico, and I thought: “What kind of a transitional economy is that one? Let’s go back to carrots.” We need to think about that: how are we going to undo, how are we going to deconstruct, the dysfunctions of these economic systems? In an Anishinaabe or other indigenous economy, one’s stature is associated with one’s generosity. That is why we have massive giveaways; that is why we have massive potlatches, which are ceremonial feasts at which possessions are given away or destroyed to display wealth and enhance prestige, because your stature in your community is ensured by how much you give away. In today’s society, people’s stature is ensured by how much they accumulate, and wealth is aggrandized. We don’t ask where they got it, how they got it, and how much they need. We act as if it doesn’t matter, and what I’m saying is that perhaps the time has come to turn that around because it’s not going to work out. Let me tell you what I think about this. And I won’t go into the consequences because I think you already know about the destruction of so many species of life. For example, fifty million buffalo, the single largest migratory herd in the world, destroyed. General Philip Sheridan, commanding armies of the west, urged destruction of the buffalo herds, foreseeing that when they disappeared, the Indians would disappear along with them; by 1885 the buffalo were virtually extinct, and the Indians were starving. In the same Great Plains territory, where there was once tremendous biodiversity—250 species of grass that could support 50 million buffalo—today you have 28 million head of cattle, and they require an entire fossil-fuel economy to support them. Those cattle have no idea how to survive a winter in North Dakota; they’ve got to be taken care of. A cow will run from a storm. That’s why 100,000 cattle died in a freak blizzard four years ago in South Dakota, and similarly about eight years ago in Colorado 25,000 of them kept fleeing the storm. Buffalo will turn and face a storm. They can turn their heads in a corkscrew way, enabling them to eat the grass. What I think about is what the land tells us about how to live. I don’t know if any of you remember Frank and Deborah Popper or their great book, Buffalo Commons, that came out in 1987. When they first went to North Dakota to give talks about their book. They were treated as heretics. They basically said that there were a growing number of farms in foreclosure and a growing number of farms participating in aid programs, which resulted in a major depopulation of North Dakota. Probably some people moved to the Berkshires, but most of them went to the Bay Area from what I can figure, and to Minneapolis. People always tell me, “I used to have family in North Dakota.” If any of you are from North Dakota, I think you should move back; we could use a little help, frankly. In 2012 Craig Cobb moved to Leith, North Dakota, where he bought 12 plots of land in that tiny town in the hope of turning it into a white-supremacist stronghold. That’s not the kind of help we need, and fortunately he didn’t succeed. Come on, North Dakota. You’ve got to move on. Back to the Poppers: They observed that the current population was depleting the water and soil of the Plains, so they suggested a government-funded restoration project that would relocate inhabitants, replant the grasses, restock native animals, and make large sections of the Plains a “buffalo commons.” Their proposal was to pull down the fences and turn the land back to buffalo. It’s not as though these ideas are only indigenous ideas. It’s what people who care about where we should be heading are thinking. It takes courage and more courage, but these times mandate that we have courage. The times we are living in do not mandate that we sit and debate things endlessly on our islands of political correctness. The times require that we take action and do the right thing. The buffalo are gone, so much else is gone. When I think about making America great again, that’s what I think about, that’s when America was great. America was great when there were 8,000 varieties of corn, and none of that corn was developed by Monsanto or Syngenta; it was all developed by indigenous people. That’s when America was great. America was great when there were billions of passenger pigeons before their mass extinction—in part human-caused by widespread shooting. America was great when everyone could safely drink the water. A lot of you don’t even remember these things, but I remember, and I don’t want to ever have ecological amnesia. That’s what Eva Saulitis called it when you no longer remember what was in your ecosystem. Some of you who are older may still remember when you could fish someplace where you cannot fish now, right? And I think about that. I was born in East Los Angeles. As part of the Indian Relocation Act of 1956, my father left the Reservation and found work as an extra in Western movies. I remember hunting on horseback with my father in the hills of Pasadena. That’s cool, isn’t it? He had a gun, not a bow. There were deer, and there were enough that a man from a reservation in Northern Minnesota could still hunt. When I think about it, I realize that I want that gig back. I want it back, so that’s what I’m working on. We’re instructed by our prophets to follow a shell which appeared in the sky, and so we follow that shell to the place where the food grows upon the water. That is where our wild rice is. I’m going to tell you about some of the battles that we’re in. What we realized is that we are the people who are the best wild ricers in the world, and what we should do is fight off those people who would drive the price of rice down, those non-Indian businessmen, and we should fight off the GMOs and fight off the rice-paddy industry so that we can get a fair price for our rice. Those are the battles we started in the 1980s. We sued Anheuser-Busch—one of the largest purchasers of rice, used in brewing the beer—which was selling rice with two Indians and a canoe on the label. That’s more than a little misrepresentation in advertising for rice that came out of a diked paddy in California. Today my tribe sells about 500,000 pounds of wild rice. I’ve got some for sale in the lobby. It’s pipeline-free because we’re still pipeline-free. What we wanted to do is capture the value added. I was sick of seeing everything go off Reservation. We began marketing traditional foods through Native Harvest and carried that through with the marketing of the pipeline-free rice. We were trying to capture some of the natural capital and use it for the benefit of the people living on the Reservation. It’s a constant work in progress. Long ago, in 1865, the people in my territory in a village on Keweenaw Bay Reservation in Michigan sold over 453,000 pounds of maple sugar. That’s quite a lot of sugar. As you all know, the thing about the sugar from a tree is that you leave your forest intact, and you can go back to it every year. Both wild rice and maple sugar are traditionally harvested products that white people are now marketing, and they are taking over the majority of the market. I think about what I want to restore and what I’m going to defend and what I’m going to keep. I’m going to keep my lakes clean so that my rice continues to thrive; I’m going to keep my lakes clean so that my fish are there. That’s my retirement plan because I don’t have a very good 401K after forty years of organizing. My retirement plan is to be able to eat in my ecosystem and try to ensure that my descendants and my community are healthy so we can take care of each other. I think there’s value in thinking about that because I know how much Americans fear being old and alone. It’s not stashing away money that is going to give us security in our old age. It’s our community that is going to give us security in our ecosystem. When I was on Vanuatu Island, that’s what I saw. There were no homeless people because the inhabitants took care of their older people by living together. It was quite warm there, so people didn’t wear any clothes, which I thought was pretty cool. When they did wear clothes, they all had sarongs that had “Bob Marley,” the Jamaican singer-songwriter, printed on them. It was as though Bob were there. And then they had something I really liked: there was a little brewery in Vanuatu. That’s a good lesson for all of us as an example of local production for local needs. After winning the Happiest Place on Earth Award in 2006, Vanuatu was unseated by Bhutan in 2007. I was at a meeting with Mr. Vanuatu and Mr. Costa Rica, and I asked, “So what happened, Vanuatu?” You know what he said? “Faulty metrics. We’ve still got this, we’ve still got that.” They are an island, and we should all act pretty much as though we’re an island because with limited land, we need to conserve our resources. Instead of crushing their plastic bottles, they refill them, and I thought, “That’s how you come to have a reduced materials economy. You quit crushing everything and pretending you’re recycling it.” The process of recycling consumes a lot more energy than re-use. You just stay old school. I live a privileged life because I live in the same place where my great-great-great-greats lived, but I also travel around, and I get to hang out with cool and interesting people. I think about the implications of that for my community. Let me tell you a story. Five years ago the Canadian-based Enbridge Corporation—the single largest pipeline company in North America—decided to throw a pipeline across our greatest wild-rice lake. I didn’t know anything about pipelines, to be honest, and I’m actually not opposed to pipelines. I think water and sewers are great. It’s what’s in the line that we’ve got to worry about. We all like infrastructure. I’d like some functioning infrastructure in my village. When Enbridge announced its intention, my reaction was “Holy buckets”—as we say in Northern Minnesota. It’s as though I spent 20 minutes with you, and then I had to face all of your Norwegian and German relatives in the north, where there’s all kinds of anti-Indian racism. I realized that if we could get the Norwegians mad about the pipeline, we’d be in good standing, you know. I wrote articles saying, “Come on, we’ve got to fight this pipeline together.” So we built a multi-racial alliance, informing ourselves that it was a fracked-oil pipeline coming out of the Bakken shale plays in North Dakota, and it was headed toward Lake Superior, which has the port that is farthest inland—an important fact to note. It is also the source of the fabulous Enbridge Line 5, which goes across the Mackinac linking Lakes Michigan and Huron, and of other lines that go across Michigan, including the one that caused the Kalamazoo River oil spill of July 2010. It was one of the largest inland oil spills ever. I hadn’t known anything about Enbridge until the announcement was made, and I said, “That’s not going to work out.” I showed up at the first hearing and said, “Look, I’ve seen what you did in Canada: You used diesel generators to run your lines across villages with 150 tribal people who were living out there in the brush, and you acted as though you had consulted with them.” I said, “There are 22,000 of us in this Ojibwe tribe, and we have jurisdiction over a wide area. There are seven large Ojibwe tribes in Northern Minnesota; you’re not going to run over us.” And so we mounted a battle—a four-year battle. We went to every hearing and forced the state of Minnesota to require an environmental impact statement. Enbridge even appealed it. That’s how unbending a corporation can be when it’s court-ordered. Everybody here knows how the economic system works: If a corporation has a mega-project, the longer you stall it, the more trouble it gets in. That’s how it works. The longer you stall, the more insecurity there is. The situation kept getting a little worse for them, kept getting a little worse, and as Judy said in her introduction, we rode our horses along the pipeline—I’ve ridden hundreds of miles of pipeline—and we prayed, we had our ceremonies. On August 2nd I dreamed that we should ride our horses against the current of the oil, and at the time I didn’t even have a horse trailer, so that was a lot of work. But the day after our fourth ride, the Enbridge Corporation announced the cancellation of its Sandpiper pipeline, which was to go through Minnesota to Superior, Wisconsin. So take heart, my people fighting pipelines, because you can stop a line. But what Enbridge did then is move to North Dakota, and it purchased 28% of the shares of Dakota Access Pipeline, LLC, constructed by Energy Transfer Partners, the parent company of Dakota Access, which was not in great shape financially. Enbridge emboldened DAPL with its large investment. Without it, there probably would not have been enough investors to pay for the construction of the line. A lot of you supported us at Standing Rock, and I’m really grateful to Jodie Evans, social-justice activist and co-founder of Code Pink, and Judy Wicks, a couple of my allies out there, for their help. A lot of you sent supplies, including in January. Everyone knows it was brutal out there and that the system did not work. Everyone knows that the rights of corporations superseded the rights of individuals out there. Everybody knows that Water Protectors are courageous, and I’m very honored to be a Water Protector. That’s what I consider myself. We call North Dakota the “Deep North.” That’s how we refer to it, and you all saw what is meant by that. Native people have been treated that way for a long time, and the pipeline people didn’t think anybody was going to notice when they militarized the situation. They didn’t think anybody was going to notice when they started shooting us and water-cannoning us in freezing temperatures. That happened because civil society abandoned North Dakota. Something I want to say to you all is that you’ve got to quit living in comfortable places. I don’t know how else to put it. Everybody abandoned North Dakota because it was cold. I want you to know that there’s a Thai restaurant in Bismark. You can go back to Bismark now. Do you understand what I’m saying? Everyone wants to live in really cool places like Oakland or San Francisco or Madison or this great place right here, right? But as a consequence the American Civil Liberties Union had only one person who covered North and South Dakota. The Sierra Club had only one person. Basically, I live downstream from every bad thing that happens in North Dakota, and I don’t have a team there to work with because all of your relatives and all of the civil-societies movement went to places where it was comfortable. I’m being honest in making that criticism because I’ve still got a battle in North Dakota every day. In fact I’m flying there tomorrow. That’s where I go. I fly in and out of North Dakota, and my White Earth Reservation is right next to it. I’ll be back there fighting Line 3—950,000 barrels a day. We’re duking it out, you know. Two days ago word came out of the hearings that Enbridge is looking a little shaky. I can talk about that in the Question Period. We battled out there a long time, and in the end that pipeline was put in. But you know, to me it was like a Selma moment. What I mean is that the $3.9 billion spent could have been used instead to set up 323 2-mega-watt wind turbines, 61,000 8-kilowatt solar panels for the houses of North Dakota, and about 120,000 solar thermal panels for the houses of North Dakota. Now that’s what energy security looks like, isn’t it? What is the lesson for me of where we are going? I believe, frankly, that the unenlightened Trump people took over the political system. They took the political system across this country, but they didn’t take the economic system, and that is what our job is. It is what this discussion is about. The reason I think so is that Exxon’s free cash flow, according to Forbes, went from $4.1 billion per quarter in 2011 to $2.8 billion per quarter in 2012. That was under Rex Tillerson when he was the CEO. If he’s so smart, why did that happen? And now of course the smartest guy in the world hired him, right? What I’m pointing out is that someone missed the memo on divestment, someone missed the memo on the move to green energy, someone missed the memo that GM just announced it’s going electric with its cars. Did you all see that? Someone missed the memo that it’s cheaper to do the right thing, someone missed the memo that the combustion engine in the vehicle that most of us came in is 25-30% efficient whereas the engine in an electric car is 90% efficient. So I feel that things are moving, and we need to move with them. My plan—Judy talked a little bit about it—is like the Schumacher Center’s. I work locally, but I work regionally as well. I work with a lot of tribes. I’m a tribal economist basically, and my theory is based on my practice, which is to get something done. We started a long time ago to market our wild rice. Some people will be inspired, others will get the idea, figure it out, and make mistakes that must be addressed next time. I could wait for the state of Minnesota and the Enbridge Corporation to set the agenda for energy in my state, or I could say, “You know what, you have no good ideas, so we’re going to come up with them.” And that’s what we’re doing: every tribe in my territory is looking at solar; every tribe is looking at wind. In my village we’re about to start manufacturing solar thermal panels. You know, they’re not the most beautiful things, but you put a 4×8 panel on the south side of your house in a housing project, and it saves 20% of your heat. Now what’s not smart about that? Because in my territory we’ve got fuel poverty. We’ve got people who have to decide if they’re going to either heat or eat in the wintertime, and you know that the Trump administration is not going to give them the kind of help they need. Rather than waiting for someone else to fix it, let’s just do it ourselves. I’ve been inspired by the Zapatistas, whom I’ve been privileged to be with and who said, “Organize in the places where Neo-Liberalism is not.” That’s my territory. Nothing ever trickled down to us. We never bought in, you know. We never became complicit because we never got a piece of the damn pie. We decided to go ahead on our own because we knew we weren’t going to get help elsewhere. So we started with the solar, and we got a lot of local food. I grow heritage corn varieties, which is what I really like to do, and those varieties are climate-change resilient, they’re drought resistant, they’re frost resistant, and when the big winds come through, my corn is short and doesn’t blow over. That’s what I work on. This year I have a hemp Kickstarter. I just had to put that out there. I’ve raised $65,000 so far, and I’m going for $100,000 by Thanksgiving. The money will help purchase 40 acres of land where my Hemp and Heritage Farm will be. This farm is going to be a model for restoring traditional varieties, for hemp-test plots, and a training place for horse-powered agriculture. I have to tell you about it because I know you’re the kind of people who might help me. There are some cards in the lobby. Native American Heritage Month is my month, so I’m doing my Kickstarter. The point is that between Columbus Day in October and Thanksgiving is really the only time most Americans think of Native people, but to be honest, I think of you all every day. Having said that, I’m interested in fabric such as the fabulous hemp shirt I’m wearing. This is part of what we need to do. It turns out that you can’t mill hemp in this country, but it also turns out that the state of Minnesota had 11 hemp mills until 1943. My interest is in fabric because we need to clothe ourselves, and everybody knows that pretty much everything we’re wearing is toxic as a result of the microbeads and the cotton that underwent some appalling use of chemicals. Until 1920, 80% of our clothing was hemp. Let’s just do that again. As we divest, we need to reinvest, right? And I’m not just talking solar and local food systems; at this point, I think we need to talk about reindustrializing or remanufacturing appropriately, although I’m not the right person to figure out how to run a hemp mill with wind power. A couple of days ago I was at Carleton College in North field, Minnesota. It’s on the Standing Rock River. That’s what the Dakota people call it. They once had 15 our mills on that river, and I thought, “That’s what we need to be able to do.” In this country what we do is shop. Seventy percent of our economy is based on consumption. We don’t make anything anymore, we just buy from everybody else. In the next economy we’ll do meaningful things, and we’ll do them appropriately. We’ll grow food, we’ll produce it, we’ll have efficiency—because who wants to be inefficient?—and we’ll begin to rebuild and restore this economy. Here are my closing thoughts. One, quit moving around. I like Wes Jackson’s milling-about theory, according to which the more you move around, the more you consume. I suppose that all of you are pretty much set to stay here, but overall America needs to stop moving to greener pastures. Get someplace, stick there, and fight for it. I am so tired of people telling me: “I don’t like it here no more. I’m worried about them pipelines that are coming in. I’m moving on,” and I say: “Stay here and fight. Stay here and act as though you mean it. That’s part of your responsibility; it’s the covenant.” Just because you’re privileged doesn’t mean you get to keep moving to someplace else. You’ve got to stay in one place, and some of you will have to go back to North Dakota because God only knows we need your help. I’m trying to do the best I can in my little village. We’ve got all our micro-enterprises. If I could get freed from fighting Enbridge I’d be so happy, but I’ve got to stick there to the end. This is the last big pipeline battle. I want you to know that because there were four tar-sand pipelines in the works about a month ago. Then Energy East—the biggest one, from Alberta to New Brunswick—was canceled two weeks ago; Trans Mountain also cancelled, giving economics as the reason, but it was also citizen opposition. That’s what drives economics. Trans Mountain is mired in litigation. The Keystone XL Pipeline threatened to reboot in that fairy dust Trump claimed he had—but he didn’t. KXL doesn’t have any customers, doesn’t have any shippers. There’s no point in building a pipeline if there are no shippers, right? The last pipeline battle is Enbridge’s Line 3. We’re hanging tough, but we need you to support us. A few take-aways: I think we should all support the next economy in Puerto Rico. I know you might ask why I am saying that. I’m saying it because it is a snapshot of everything that’s wrong. Puerto Ricans should have had all of their own food and all of their own energy. The Jones Act, a century-old U.S. law that is making it difficult to get supplies into Puerto Rico, has shackled that country and made it as poor as a colony of the United States. When Elon Musk, the Chairman and CEO of Tesla, said, “I’m going to solarize it,” and a bunch of other people started working on it too, I said, “I’m with you.” I think that’s beautiful. Let’s just do it together as people of conscience. There’s a lot of interest in solar for Standing Rock, Puerto Rico, and tribes in general. I think about Puerto Rico because it’s an example of crisis bringing opportunity, and it’s an opportunity to do the right thing by supporting the efforts of what is called the Just Recovery to rebuild Puerto Rico from the grass-roots up. Elizabeth Yeampierre, a Puerto Rican attorney, and Naomi Klein wrote about it in an article forThe Intercept. As we consider the long term, I know you have already decided that you’re dropping your baggage so you can work on the rights of Mother Earth. The rights of Mother Earth need to supersede the rights of corporations. A final reminder of the covenant I mentioned earlier that Anishinaabe people have with the Creator about how to relate to the world we live in and what our responsibilities are You all have that covenant too. Alice Walker said, “Activism is my rent for living on this planet.” However you say it, I feel as though we’ve got a really good gig here, and you’ve got to do something; you can’t just sit on the sidelines. You’ve got to always be active and positive in protecting our planet. Miigwech, thank you for your time. Q: You’ve accomplished so much in your exciting and impactful life. Is there anything from your background that helped you prepare for what you’re doing now—a mentor or mentors or particular specific experiences or lessons that guided you? A: I come from a really highly functional family. Nothing was messed up. It was all good. We all loved one another. Super tough. There were a lot of generations of people who stood up for what they believed. And then in my life I started doing work when I was seventeen. At eighteen I went to the United Nations, where I was in the presence of some of the greatest political leaders of our community. And I listened to those people. I sat in a lot of rooms and listened to great leaders. I still get to do that. All of you are a privileged bunch. You go someplace, and you say, “You know, these people have a tough situation, but they know what to do about it, don’t they?” Is that not inspirational? I think of all that we have, and yet we don’t do half as much as so many people who have so little. So I tell myself that I’m just going to try to do a little better. My organization, Honor the Earth, is what I’m primarily involved in now. We doubled in size over the past year. I’d raised piles of money because it’s a lot of work fighting big pipeline companies. We work with a lot of other groups, so the ground team in Minnesota is strong. I do want to mention that if you felt your experience at Standing Rock was inadequate or you weren’t arrested or you weren’t able to go, you can come see us in the spring. Come to Minnesota if they issue that permit for Line 3. We’ll be camping. Q: How do you touch the hearts of people who don’t agree with you or are still involved in the extractive economy? A: I just do my best. Those of you who have spent time with me think I’m a really nice person. I actually consider myself a nice person. So I just talk to those people, but right now many of them are haters. The United States has a D in infrastructure, which is shameful. It means your gas mains explode, gas is leaking everywhere in Boston, and bridges collapse. This shouldn’t be happening in a first-world country. I keep pointing out to the pipeliners, who need jobs, that what we need is infrastructure for people, not for oil companies. I’m not opposed to pipeline workers, and I’m not opposed to welders or unions. I just want infrastructure for people. Right now in Minnesota, a perfect example is that there are 323 miles of pipeline sitting in piles from the Sandpiper pipeline that we defeated. I keep telling Enbridge and the state of Minnesota that they should ship those pipes to Flint. Ship those pipes to people who need them. To me that’s part of the battle. Q: How can we best help from here? A: Well, I gave you the Puerto Rican route and the effort called Just Recovery as examples. Even I, Mrs. Way-Too- Busy-to-Clean-My-Room, am working to support Puerto Rico. There’s material about Honor the Earth in the lobby. If you want to support the frontline work in Minnesota, please support Honor the Earth. I did give my pitch for my Winona’s Hemp Kickstarter. Those are a couple of organizations that need your help. Honor the Earth is working not just in Minnesota; we’re a national organization. When I left Standing Rock, my heart was hurting so bad. I think a lot of people were hurting. Although I lost a horse, I didn’t get shot, and I did give blood. My family was shot at; my family was arrested. We’re still paying for that North Dakota trauma. I’ve been trying to get justice for Water Protectors, and we had a lot of those cases dismissed, which was really great. Of course, then the state tried to ban our lawyers, and I thought, “You’re so horrible, North Dakota.” We’re returning to Standing Rock this fall to do solar work. If there are Water Protectors among you or if you know any, support them in the legal case. And then just work on bringing about change. You have something special going on here in the Berkshires with your local currency. It’s really great. Keep it up, but then work in other places as well. Work in places where it’s not so comfortable, you know. We all need that. Q: There are two local pipeline projects: the Kinder Morgan pipeline and the Connecticut Expansion Pipeline that will run through Otis State Forest in Berkshire County. What advice might you offer to those who are working to oppose them? A: Do the same thing we did: just keep at ‘em. I mean by that a couple of things. We have six old pipelines in our territory. They were installed in the 1960s before the Clean Water Act or the Clean Air Act. You can imagine how well they’re doing. One of them is a line Enbridge wants to replace because it’s in a state of deterioration. That’s worrisome, and so the company wants to abandon it. I have a problem with abandonment. I think there are liability problems for landowners once those companies start abandoning what they installed. For example, the best moment in court was when the youth interveners got a place at the table. A 22-year-old woman was questioning someone from Enbridge, and she said: “In your testimony you say that the pipeline lasts 300 years in the ground, and even if it’s abandoned it’ll still be 300 years. But in another part of your testimony you say that Enbridge will ensure the safety of that pipeline for as long as the company is there. So are you going to be there for 300 years?” You should ask questions like that one. Corporations are fictitious creations. We don’t know how long Enbridge will be here, so we need to make sure that it cleans up its messes now and is a good corporation. It has to be a good corporate citizen. So keep battling. Then look at the transition plan for a low-carbon future. Ask: “What is this for? What are these lines for?” In our case, the lines make no sense. So we have to keep moving for the transition, and the longer we fight the corporations, the more expensive it becomes for them. Kinder Morgan is not in the best shape because it’s buried in litigation in British Columbia. These pipeline and oil companies have no transition plan, so when we are battling their projects, we have to keep in the narrative that we do need to transition and that their projects do not help that transition. Q: At Standing Rock I was really impressed with the role of the youth. They actually were leaders in starting the whole movement. One of the things I’ve been worrying about is what happened to those youth who were so inspired at Standing Rock? Are there programs that they’re engaged with at present? A: I am not at Standing Rock now; I’m at home, but what I will say is that we have a camp in Minnesota, and a lot of Water Protectors have moved there. We have a couple of hundred people already camped, and Enbridge is very upset about this already. If the permit is issued, which the State of Minnesota has not recommended so far, thousands of them will be there. As for youth staying on, Honor the Earth developed a Young Women’s Leadership Program because so many young women were politicized at Standing Rock. They’re great organizers, and they were just out at Pine Ridge learning how to take water samples. There are a number of initiatives that the youth leadership is involved with. And then too, these leaders are fighting in their own communities. A lot of them went back to their Navajo Reservation. And a lot of them, emboldened by their experience at Standing Rock, went to places where there were brutal battles. When I was at court a couple of days ago, I saw many lawyers, including a couple of ours, and there was a young woman who asked the best questions. I thought, “The youth get it; let’s support them.” That’s what I want to see is support for the youth leadership. Don’t hold on to something, don’t try to hold on to the old ways. The last round of the battle against Sandpiper was brutal, and I remember those Enbridge guys used to hang their heads when we’d walk in. I’m not Enbridge’s problem. It’s the 500 youth who are camped. That’s their problem. I am not their problem now. When I walk into a hearing room, it’s packed with young people, Water Protectors. And I say to myself: “You thought you had problems with me, Enbridge? You ain’t got no problem with me. That’s your problem right there.” I’m all for them. Q: How do we come together when we all have inherited traumas among our own people and among all of us? A: Well, you have to work on your healing and not take your bags with you. Is there such a thing as an oppression quotient? You know, something like “Who is most oppressed”? That won’t work out. The community I work in has a super messed-up situation, and when people come to me, I say: “Don’t bring your bags. We’re working on our current problems here.” We all have to take responsibility. And then there’s the collective reality that a lot of the conditions causing our trauma have to do with the colonialism in this Wiindigo economy. We’ve got to recognize that it’s not personal trauma, it’s systemic trauma. If you want to get well, there’s no amount of counseling that’s going to help you. You’ve got to change the system. Q: How might we best go about building the capacity to make things? I’m just saying we’ve got to learn to make things. I’m somewhat handy. I can sew, I can grow food, I can cook. We need to re-learn all that. I raise teenage boys—oh, they give me headaches sometimes—and the worst insult in my house, and I’m sorry to say it, is, “You’re like a white kid from the suburbs.” The figures show that the average American home has a hundred slaves working for it. Think of the labor force in developing countries that manufactures the products our households use, such as clothing from Pakistan, and the food grown in the US that is harvested by migrant workers. We’ve got to quit letting that happen. So you do it in your own process. My 17-year-old, 6’3” son was crying about how he was robbed of his childhood because he had to cut wood. Please do not pass this out of the room because he will kill me if he finds out I said that. And his girlfriend’s response was, “At least you know how to do stuff.” The kid knows how to fish, but that’s it. My advice is to quit babying everybody! And quit acting as though you should buy everything. I know that you all are not those people, but I know you like clothes, and you cannot just buy your way out of this, either. I’m just saying: Be handy. Be useful. That’s what I always tell my daughters: “Find a handy guy.” Don’t you all tell your daughters that? “Find a handy guy. You don’t want someone who doesn’t know how to do anything. That’s horrible! You’ll be taking care of him. You don’t want to do that!” That’s my approach. You can imagine why you wouldn’t want to be my child. Q: What is the role of art and music in your community? Native women are invisible in the North. We’re so invisible that many of us end up in the river. So many missing and murdered women in Duluth, along with Fargo and Minneapolis. I have a cousin who was in the river. Two months ago there was another woman in the river. An indigenous artist named Votan painted a mural of a Water Protector. It’s 60 feet tall and 40 feet wide. She’s in downtown Duluth on the side of a building, wearing a cool hat and a bandana hiding her lower face. Our bagged coffee has her on it as well. We won’t be forgotten now, will we? My thinking is this: Be beautiful. One of the things about humans is that we can do beautiful things. So be one of those people and surround yourself with them. I try to do that. I’m privileged to work with a lot of musicians who support us in our work, who come to our communities and do benefit concerts. For example, the Indigo Girls and Nahko Bear were on the board of Honor the Earth. I work with so many beautiful musicians that I’ve learned music is magic just as art is magic. This movement for environmental justice, indigenous rights, and a just transition is not like a technical movement even though figuring out how to power those hemp mills is kind of a technical thing. I’m saying that your relation to the movement, with its beauty and music, has to be from your heart. Q: Considering the environmental crisis, the inequality crisis, the political crisis—all the crises we’re facing right now—what advice can you give us in terms of what we can do to have an impact in our own communities? A: Do the right thing. Do the right thing where you live. Most of you are wealthy, so make sure that you share your wealth with others. And support Puerto Rico. A lot of people have land that they don’t farm or don’t live on. Let some small farmer go there. Help the land be what it’s supposed to be. The dairy termination program enabled by the Farm Bill of 1985 killed a lot of cattle. It was meant to reduce the cost of federal purchases of surplus milk under the dairy-support program. It was sad to see those dairy cows with Xs on their foreheads. There are so many farms that have no animals, and that land needs those animals back. If you’ve got some land, the way to bring them back is by helping a young farming family to work with you. That’s the way things change: you let go and take a breath. You are a smart bunch. A lot of our people don’t have the skill set you have. I don’t have the skill set either; I’m not going to say in business planning or the like because I don’t run a conventional business, but you can think of ways to share your skill sets. If you’ve got something that’s helpful for communities, share it. I don’t even have the technical writers I need. I’m so far behind in reporting on my proposals because I’ve been busy doing them, and in addition I had a big harvest. So help out. Share what you have.